The EcoHitch® hidden hitch for the 2010-2014 Subaru Outback is designed to be completely concealed so you only see the receiver once it installed rather than having to see an unsightly crosstube underneath your vehicle. Rated for 525 pounds tongue weight and 3,500 pounds towing weight, this trailer hitch for Subaru Outback is full of personality that complements your Subaru. *If you’re going to be towing and need trailer wiring, click here! Ensure your wiring harness does not drag on the ground by visiting our Eclipse. Giving you the ability to bring your bikes, extra cargo and so much more on your next adventure. For more information on trailer wiring, click here! One of the first of it’s kind, you know that any hitch or accessory that you put on your Subaru Outback needs match its innovative design. With the EcoHitch hidden hitch for the Outback, you are getting inventive designs with the hitch created to fit perfectly to the underside of your sleek Subaru. The EcoHitch® hidden hitch for the Subaru Outback comes in both 1 ¼-inch and 2-inch receiver sizes, you decide which bike racks and cargo trays will work best for the receiver you choose. This hitch for Subaru Outback will give you the ability to have an amazing ride in your car without changing its style or efficiency especially because the only part of the hitch that is visible once it’s installed is the receiver. Made from recycled materials making the EcoHitch Hidden hitch an eco-friendly hitch, you won’t have to leave anything behind with this Subaru trailer hitch. 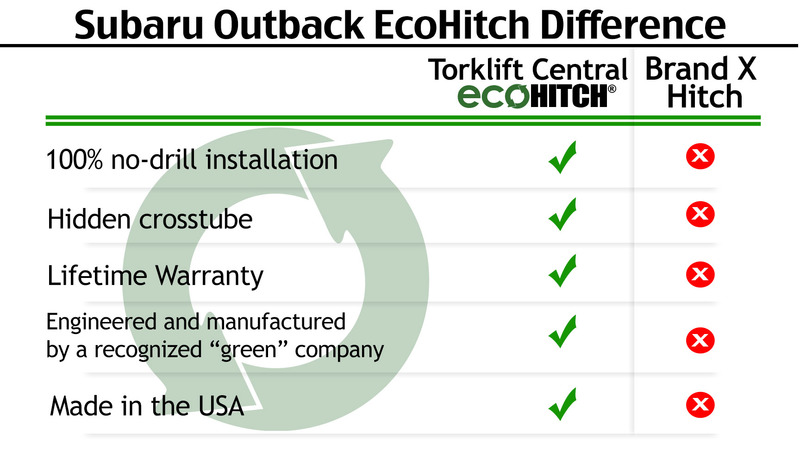 All EcoHitch models are precision manufactured to have hidden crosstubes when installed. The only part of the hitch that is ever visible is the receiver and has a higher level of ground clearance than most hitches available. x7162 40 lbs 42" x 12" x 28"
x7170 40 lbs 42" x 12" x 28"
*WARNING* Your vehicle may have a lower tow rating than this trailer hitch. If your vehicle's tow rating is less than the rated towing capacity on your Torklift Central trailer hitch, your trailer hitch capacity is limited to your vehicle's factory rated towing capacity. *This video is intended to give a general overview of how this hitch is installed. For more specific information or details, please refer to the written instructions.